I spent the last week in Nags Head, North Carolina, with a few of my friends renting a vacation home and we took advantage of the numbers to buy a few bottles of whisky. 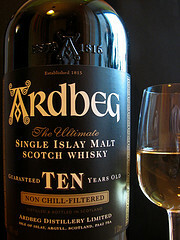 One of the prime choices was Ardbeg 10, a bottle I’ve wanted to try for a while but hadn’t gotten around to it. As a fan of Lagavulin and Laphroaig, I wanted to try what is billed at the peatiest of whisky. When I poured it from the bottle, I was struck at how light it was. It’s a pale yellow, very pale, and the peat and smoke is very evident. I added a few drops in and it opened up a little, with a little fruit sweetness hiding behind the smoke and warmth of the whisky. This entry was posted in Tasting Notes and tagged Ardbeg, Lagavulin, Laphroaig by Jim. Bookmark the permalink. Ardbeg offers verious peat level in their range. I would say the 10 year old price is very approachable but offers very light peat in comparison to other Ardbeg. It’s a very nice drink for almost all occasions due to light peat. I think it will be hard to find other Islay 10 year old like Arbeg 10.